What does a sustainable photography studio look like, and how do you create one? Jason Lindsey worked hard for several years now to make our studio sustainable. In the process, we’ve encountered some unexpected challenges and reaped some surprising rewards. We began when we relocated our studio to a 2200-square-foot brick building that was constructed between 1890 and 1900. We knew we had our work cut out for us. The building was drafty. It had an earthen crawl space, no insulation, including in the attic, and a few loosely fit, single-pane windows. An inefficient, dilapidated natural gas-powered, forced-air HVAC unit was used to heat and cool the building. It was lit with energy-guzzling T12 fluorescent, incandescent and halogen lamps. The owner of a store located in the front half of the building was paying $350 in winter for electricity and heat. Since we’d be using the entire building, I realized that if we did nothing, we’d be paying a staggering $700 per month for the same services. We planned to rent out the front half of the building for retail use, and remodel the back half, dividing it into two rooms that would serve as the office, studio, and gallery. To plan the project, we asked for help from the Smart Energy Design Assistance Center (SEDAC), a division of the University of Illinois that helps business owners improve energy efficiency. Their staff completed an energy and cost analysis, and suggested several improvements, most of which we followed. First, we weatherized. We added insulation to the walls and attic. SEDAC recommended that the attic floor be insulated to R-30, potentially with 9.25″ of fiberglass batt insulation or 9″ of cellulose. We decided on a formaldehyde-free fiberglass insulation made from 25 percent recycled glass. On SEDAC’s recommendations, we insulated the attic hatch with rigid insulation on the attic side of the door and installed weather stripping around the edges. We sealed drafty spots in our brick walls by tuck pointingâ€”filling in crumbling mortar between old bricks. This also reduced moisture and bolstered the structure of the building. To reduce humidity in the basement, an earthen crawl space, we installed a sturdy cross-laminated polyethylene plastic vapor barrier to the earthen floor of the crawlspace and replaced an old energy-guzzling dehumidifier in this space with an Energy Star dehumidifier. We created two zones with different HVAC and thermostat settings for each, which allowed us to spend less energy heating or cooling the rental space in the front of the building if it is not in use. Drafty windows waste tons of energy, and so we replaced ours with double-pane windows. Specifically, we installed low-e, well-sealed, windows with non-metallic sash and a U-value less than 0.4. Finally, we slashed our use of fossil fuels by installing a five-ton vertical geothermal system. Such systems circulate fluid through tubes sunk deep into the earth, where it equilibrates with the soil around it, which remains at a relatively constant 55 degrees, regardless of season. Then that fluid circulates up to cool the building in summer and warm it in winter, slashing the need for fossil fuel-based heating. Although we installed our geothermal system to reduce our impact on the environment, we knew that investing in this technology was a smart business decision as well. This investment will reduce our operating costs for the next 20 years. For example, we now pay just $250 per month to heat and provide electricity for the entire building, as opposed to $350 the previous owner paid to operate half of it. These savings come despite the fact that we operate three Mac Towers, a refrigerator, and an array of lights in space that was formerly unused. In all, we spent $23,000 up front on energy efficiency improvements. We paid some of it up front, and rolled other improvements into the mortgage. The bank was fine with that because they knew our improvements would increase the value of the property. 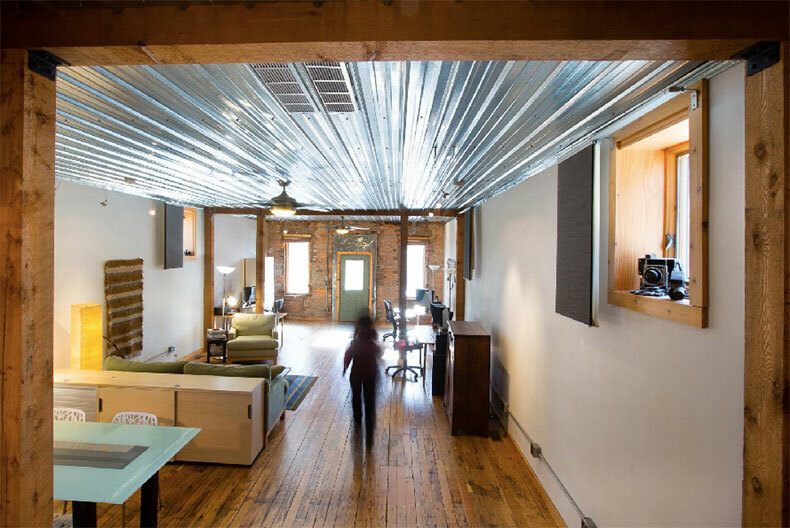 There’s more to greening a studio, however, than simply making it energy efficient. To reduce our environmental footprint, we also sought to reduce our water use. Consuming bottled water is hugely wasteful, and includes the oil and electricity it takes to produce, fill and ship the plastic container. We installed a Britta water filter on faucet so can filter water instead of drinking bottled water. We also replaced an old toilet that used 5 gallons per flush with a new one that uses 1.5 gallons per flush. We kept in mind the environmental mantra: reduce, reuse and recycle. We chose to redo our aging hardwood flooring rather than replace it. Two of the three contractors we invited in gave us estimates only to replace the floor, while the third said he could redo it. We hired him. He ended up using reclaimed wood to replace areas of the existing wood floor that needed repair. We also recycled the wood studs and lumber from a torn out wall and reused it as we remodeled the building. And, as mentioned earlier, we bought insulation with recycled glass. Such purchases promote recycling by helping create a market for recycled products. As we remodeled our interior space, we also tried to reduce our use of toxic chemicals. As a guideline, we used the U.S. Green Building Council’s LEED (Leadership in Energy and Environmental Design) Green Building Rating System. LEED principles recommend using paint and floor coatings that do not contain any volatile organic compounds (VOC), which can, at high enough doses, irritate eyes, nose and throat, cause headaches and nausea, damage the liver, kidneys and brain, and heighten cancer risks. We asked our flooring contractor for a zero-VOC floor sealer. He had never used one, and we did the legwork to help him find a citrus-based product to strip the floors and a water-based, low-VOC clear coat to seal the floors and wood trim. Afterwards, he told us he loved not having to breathe the nasty chemicals in ordinary floor sealer all day, and he was going to recommend it to all his customers. Similarly, the painter we hired had never used zero-VOC interior paints. Afterwards, he said, “This is awesome. It doesn’t stink all day when I’m in here painting.” By insisting on greener products, we helped educate several contractors about the products available, and we had a broader impact then we could have foreseen. Finally, we’ve considered sustainability when planting greenery around our studio. This year we converted about one-third of the grass into native prairie plants, and we’ll complete the conversion to native prairie over the next few years. 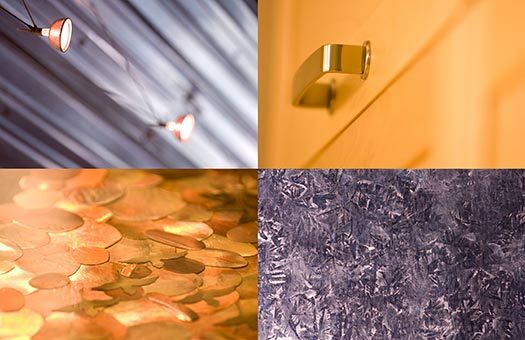 In the five years since we began to green our studio, contractors and suppliers have become much more knowledgeable about sustainable practices and materials, which has been surprising and rewarding to see. Also rewarding is the satisfaction that comes from having created a workspace that’s good for our bottom line, good for the health of everyone who works or visits there, and good for the planet. You, too, can green with your space by choosing sustainable practices and making a reasonable investment in your future. In doing so, you’ll create a greener workspace, one that’s a pleasant and positive place to work.